You have so much to buy for baby. But every pregnant women needs a few things for herself, too. It’s taken me 3 pregnancies to whittle this list down to the true essentials. You may be able to borrow these from a friend or find them at a consignment store. The point is: GET THEM! Bye bye, What To Expect When You’re Expecting, with its picky Best Odds diet. My favorite pregnancy (and postpartum) books are by chatty author, Vicki Iovine. 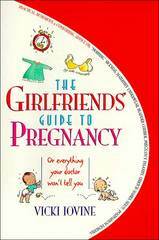 Her Girlfriend’s Guide To Pregnancy is fun to read — and it tells you just what you need to know. Good food is a much better investment than another maternity top. Supplement with a prenatal vitamin that makes you feel even better. P.S. Don’t forget to eat 5 fruits & vegetables per day! It’s madness to wear those stretched-out elastics… when your body is straining at its seams! You deserve to feel comfortable. Break down and buy maternity support products, even though you technically could get by without them. I’m all for hand-me-down maternity clothes, but get 1 flexible outfit in which you feel stylish and skinny. You’ll wear it all the time. #5 Comfortable shoes that go with everything. Pregnancy does a number on your balance. Don’t believe me? Check back at about 8 months along. Your feet will swell before and after birth. You’ll be glad you bought those simple black shoes one size larger. No one looks good in a pants suit and tennis shoes — if you can bend to lace them, that is! And I’m sure, many, many more!